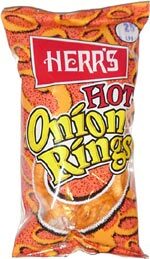 Taste test: Herr's has made an unusual twist to the ordinary potato flake-based onion rings that we've all come to know and love by adding a hot powder to them. 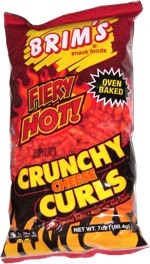 Having eaten Herr's hot version of their cheese puffs, I was expecting these to be very hot. Well, they're OK but not terribly hot. They do taste better than they smell. Smell test: Not very good. Trivia: I bought these because I was having my tire replaced at DirectTire across the street and had to kill an hour. I was getting my tire replaced because it got ruined by a huge pothole in Somerville, Massachusetts. This snack was discovered by Jeremy in Watertown, Massachusetts. Review published .